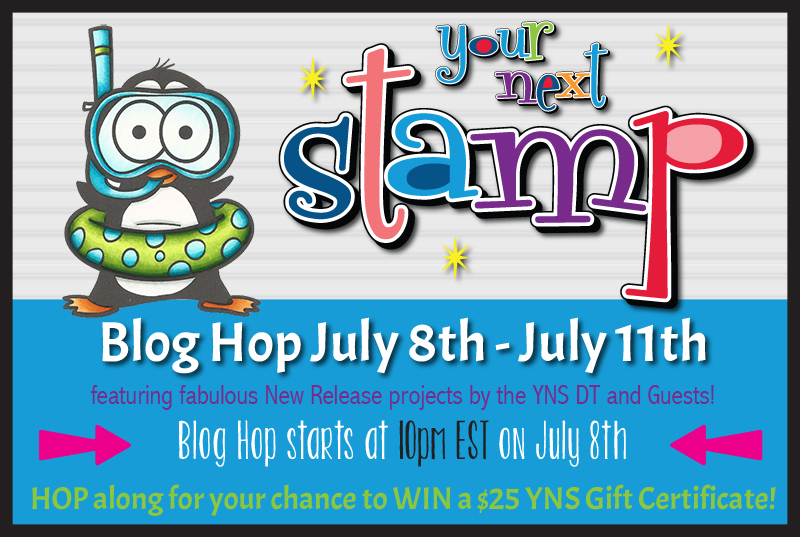 Hello and welcome to my stop on the July Blog Hop! This month Your Next Stamp "re-released" some super fun stamps and I decided to use the Hoot's Up stamp set for my blog hop project and paired it with the basket from All Aboard - Spring Carts and the candy and sentiment from Coco - Sweet Treats and Celebrate Sweetness to make a super sweet card with a fun see-through front panel! 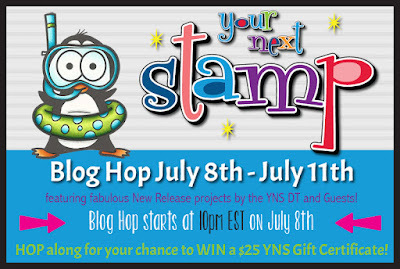 Your Next Stamp is giving away a $25 gift certificate to the Your Next Stamp store as part of the Blog Hop, you don't have to comment on every blog to qualify to win but the more blogs you visit and comment on the greater your chances of winning will be! I also have a discount code at the bottom of the post, happy shopping! and one last picture, because why not? Here's a fun sale code for your shopping! Don't forget to leave a comment to increase your odds of winning! Here's the Link Up for the rest of the hop! Happy hopping! What an amazing and detailed and colorful card. It's a true masterpiece! What a fantastic design idea. Love it. Really? I love the angle of the floating candy! And the goggles -- whoooop whooop!!! So cool! Great design! Very pretty card. I love the acetate design, perfect for that cute owl. Eeeeek! Soooo sweet and I love the floating sweets, perfect design! I totally love your see-through front panel!Very creative!Thank you for the inspiration! Wow! Super fun card! Love the clear panel! Love how the card opens ... the work with the acetate is mesmerizing! Thanks for sharing your creativity and inspiring us! This is adorable Becky. I have to pin this for inspiration! TFS! Adorable card! Love those candies and the clear front panel! What a fun and sweet card design. Becky, this card is delightful. Great idea to use the clear panel for the dropping treats. Thanks for sharing. Really great card Becky! Coloring both sides of the candy makes your card fun on the inside too. Glad you are joining us this month! Your card is amazing!! I love the floating candies! of work because we love them). love your card design!!! at first I thought I was seeing things!!! lol I will have to try that!!! awesome stamps too!!! Great use of acetate. Very creative! What a fun, clever card! Your card is adorable ! I love the work with the acetate, it's really great. So darn cute. I love the see through part. Adorable card design, Becky! Love the clear portion of the card. Very creative. You are so clever Becky, this is adorable! Oh sweet card, Becky! Lovely! Glad your link works now. Cool and fun card. That card is SO clever! So super creative, just love this one! Thanks for sharing! Great idea! very cute card! Hello Becky!! I love this card. This is fun and cute! Thanks for this hop and share this fabulous ideas!! OH! What a great idea! Thank you for sharing! Wow! This card is so creative! I never would have thought to have the owl hold the basket with candy falling out, but it looks terrific! I love the clear card front, too! This is a fabulous idea!!! love it ! Great idea and love the look of your card! So fun and the clear window with the candy is perfect! OMG, how fun! And so creative. Love this!! Any little child would love this super cute card. super love your candy falling from the sky! Cute card and love that basket! What a stunner! I just love your card! This owl card is so great, I absolutely love it, great job!